Bones are constantly recycling old cells and growing new bone tissue, but as people age, the rate of new bone growth slows down. This can cause brittle bones that fracture easily. 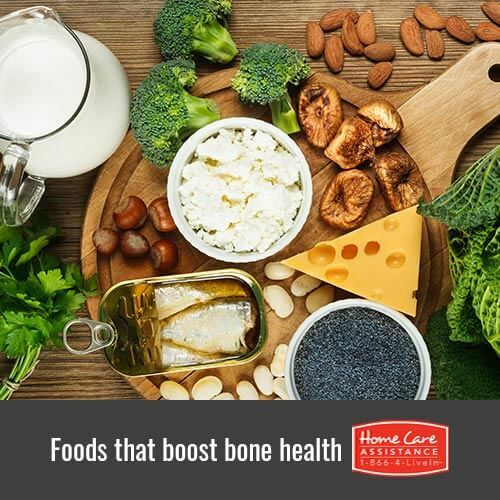 To avoid the complications of osteoporosis, Rhode Island live-in care providers recommend that seniors maintain a diet that strengthens their bones and prevents bone density loss. Calcium is the most important mineral for building bone tissue and the human body cannot produce it. Nutritionists recommend that women under the age of 50 or men under the age of 70 get 1,000 milligrams of calcium each day. People who are older, however, require 1,200 milligrams per day. Vitamin D is also important because it helps the body absorb calcium properly. Seniors need 800-1,000 IU of vitamin D each day. Milk – Dairy products like milk are great sources of calcium. Some brands fortify milk with vitamin D to further encourage bone health. Read the label to find fortified milk for your elderly loved one. Fatty Fish – Mackerel, salmon, and tuna, are some of the only seafood that naturally contains vitamin D.
Spinach – Just one cup of cooked spinach provides a quarter of the daily-recommended calcium amount. Yogurt – This fermented milk product is packed with vitamin D and calcium. Collard Greens – This green contains just as much calcium as spinach. Imagine the salads you could make! Cheese – Just two ounces of cheese contains over one third of the recommended amount of calcium per day. Eggs – Eat both the yolk and the whites to get the sufficient amount of vitamin D from eggs. Orange Juice – The ascorbic acid in citrus helps to absorb calcium. Check the label to find a fortified fresh juice that contains vitamin D.
Fortified Grains – Most grains contain some calcium, but many cereal products are fortified with even more. Figs – One half cup of dried figs has 121 milligrams of calcium. Diet is one of the most important factors in senior health and longevity. Ensure your loved one is getting adequate nutrients with help from a trusted provider of senior home care in Rhode Island. Home Care Assistance helps seniors from home by encouraging nutritious diets and daily exercise. Additionally, we help clients with other activities of daily living including housekeeping, errands, and laundry. Call us at (401) 284-0979 today to schedule a free consultation and learn more about our comprehensive services.